Back in May, news leaked that Pro Bowl Browns receiver Josh Gordon had tested positive for marijuana. He had done so before, as a rookie, and then tested positive for codeine a year ago. With this, his third offense, he’s facing a yearlong ban from the NFL. Gordon’s appealing the ruling, and his hearing will be on Friday. According to Adam Schefter, Gordon plans to argue that the positive test was inconclusive, and that it was triggered by secondhand smoke. This is now a pretty standard excuse — the athlete who tests positive and blames the testing is no different from the celebrity who claims his Twitter account was hacked. It’s just tradition at this point. We shouldn’t read anything into it. 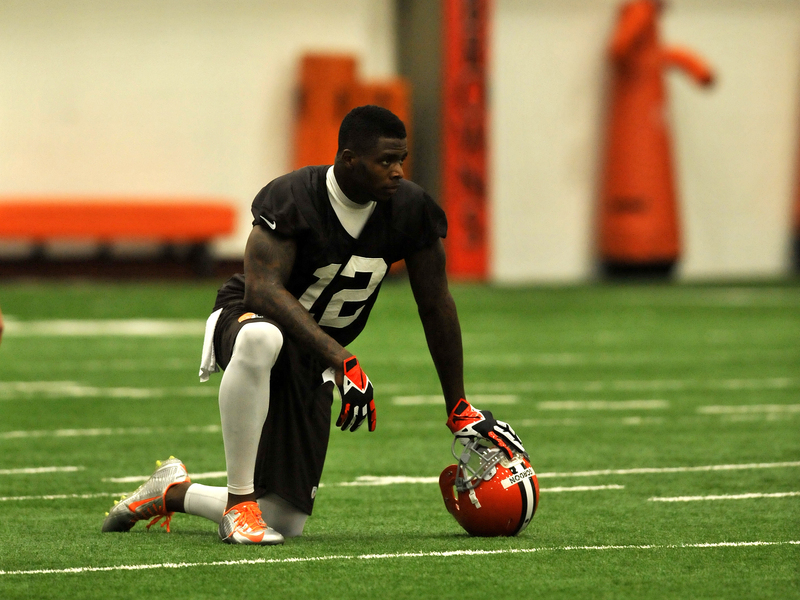 But here’s where it gets weird: Josh Gordon might not be lying. • Gordon’s prior offenses put him in the NFL’s Stage III Drug Testing program. • In addition to the yearlong penalty for any positive test, part of his inclusion in the Stage III program means Gordon may be tested up to 10 times a month. • Players who enter the Stage III drug testing program remain there for their entire career. • Florio’s source said Gordon had passed at least 70 drug tests. • The “A” cup is tested first, and if it meets the threshold for a positive test, the “B” cup needs only to show traces of the substance to count toward a positive test. • Gordon’s “A” cup tested positive beyond the threshold. • Gordon’s “B” cup did not, but did show traces of marijuana. • The threshold for a positive test is 15 nanograms per milliliter. • Gordon’s positive test (the “A” cup) was 16 nanograms per milliliter. • The “B” cup was 13.6 nanograms per milliliter. • Had the “A” and “B” cups been switched, Gordon would’ve avoided a positive test. • For comparison’s sake, Bomani Jones pointed out that the World Anti-Doping Agency requires 150 nanograms per milliliter to test positive for marijuana. • Similarly, baseball requires 50 nanograms per milliliter. So do the states of California and Nevada, according to Schefter’s initial report. • The U.S. military requires a positive test of 50 nanograms per milliliter to flag potential violators of its drug policy, and then only a 15-nanogram-per-milliliter sample when the test is confirmed. When this news first broke in May, the story was all about Cleveland’s horrible luck and Gordon’s horrible decisions. But now it feels different. Somewhere between May and researching military nanograms-per-milliliter standards on a Wednesday morning in July, this stopped being about Josh Gordon for me. He’s made plenty of horrible decisions — he got a DWI earlier this month, which really slowed down the momentum for any Free Josh Gordon movements people had planned — and his credibility isn’t great. But using Gordon’s past to justify the future penalties is a pretty lazy way to rationalize what’s happening here. Suspending Gordon for a year changes his entire career. It’s a stigma that’ll never disappear, all because of a test that doesn’t really prove anything conclusively. Did he smoke marijuana this spring? I have no idea. Regardless of what happens at his appeal Friday, we’ll probably never know. But once you look at the details of the case, the questions get bigger than whether a wide receiver smoked weed. For instance: Why does this sport need to test people using a standard along the same lines as the U.S. military’s? Why is Josh Gordon treated like a paroled criminal for his entire career after testing positive twice? Do they really test him 10 times a month? Does it make sense to treat marijuana users the same way we treat PED users? Is there anyone at the NFL who saw the positive test and thought it might be too inconclusive to publicly ban a star player for an entire year? Does it make sense for the NFL to be testing players for marijuana at all? What does the league gain from prosecuting people like this? Some of that’s genuine confusion from me, not just a bunch of rhetorical questions. My guess on the last one is that the NFL increases its control over players with testing like this — over what players do in their downtime, where they hang out, whom they associate with — and that kind of authority matters to owners. It reminds the players that they’re employees of the NFL, and that playing this sport is a privilege, not a right. It has to be something like that. It can’t possibly be that the league is so concerned with marijuana that it thinks it’s smart to fight public battles against star players over it. Marijuana isn’t a player safety concern; marijuana isn’t a public safety concern. There’s plenty of evidence that it’s actually healthier than a lot of the painkillers players ingest every week. The NFL knows all of this. The league office is in Manhattan. The people there read the New York Times every morning. It’s not like everyone running this league can just play dumb here. Roger Goodell and the owners don’t even have to stop testing for weed if they don’t want to, but everyone looks bad when it’s done like this. Whether it’s banning Josh Gordon or Brandon Browner last year, prosecuting players this aggressively and this blindly turns the NFL into the villain. We’ll see what happens Friday now. Gordon hired a powerful lawyer, and the details of this case are public, which adds all kinds of scrutiny. Maybe it’ll force a compromise. On the other hand, the NFL has already issued a statement describing Gordon’s case and promising that his argument is irrelevant. Regardless of how this ends, it all reflects worse on the NFL than it does on Josh Gordon. It’s just a bizarre battle to fight. Look at the changes happening in other sports. Look at the changes happening all over America. Only the NFL could act like it’s still the 1950s and expect the rest of us to just go along with it. Then you think back to the Ray Rice suspension last week, the psychotic uniform fines we see every year, the refusal to change the Redskins’ name, the annual crackdown on touchdown celebrations, the grandstanding with the Saints bounty scandal, downplaying concussions for the better part of the last 50 years … I guess the only way the Josh Gordon suspension makes sense is when you remember every other way the NFL insults our intelligence.